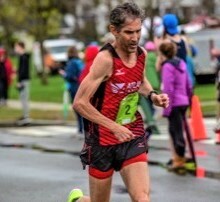 Tom Perri is a four-time finisher of the Fifty-States Club. He also achieved a goal of a sub 4-hour marathon in all 50 states. Perri’s lifetime running statistics doesn’t have one number that isn’t a triple digit. His lifetime miles as of 2018 stand at 107,897 over a span of 44 years, and his 2,000th career race was completed at Missoula Marathon on 7/9/2017. Perri is most proud of his role as a marathon pacer. “I get more joy out of helping others achieve their goals than out of any of my personal accomplishments,” says Perri, who runs an average of 40 marathons a year. When did you start running and why? May of 1975 when I ran track my first two years of high school. In my junior year I switched to band and honors program. I was a geek. I picked it up again in my 20s because it was a cheap form of exercise. I ran my first marathon in 1993 at age 32 to celebrate finishing graduate school. I drove to the start of the Twin Cities Marathon and slept in my car until it was time to take the 5:00 a.m. bus to the start. I had no idea what I was getting into. By mile 17 my feet were killing me and bleeding from blood blisters. I walked the last nine miles, finishing in a respectful 3:51. My first reaction was, “One and done. Never doing that again.” That was 25 years and 472 marathons ago. How much did you run per week in your peak years? Now? I rarely ran over 40 miles a week, which did not include my races. The only reason I continue to average 48 plus miles weekly is due to the amount of races that I run – especially with about 40 marathons a year. Now my training varies depending upon my travel to do marathon/races, with sometimes doing two to three races in a weekend. In my early days of running when doing mostly 10K and shorter distances, it was not uncommon for me to do two to five races per day on a weekend. More recently though I have doing shorter races like 5K’s or 1 mile runs, etc, the day before and/or day after the marathon to get in a little speed work. I do not include speed workouts in my mix of runs as I try to stay injury free and run with fresh legs. My favorite marathon to date has been the Runners World Tulsa Road/Road Marathon where I took 1st place overall at 55 years old. 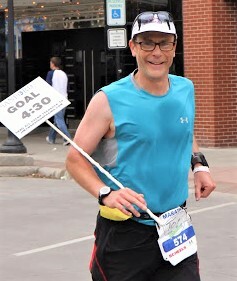 Then the Billings Marathon where I finished my sub 4 hour marathon goal in all 50 States and obtained a 1st place 55-59 Age Group award. To date I have 494 overall wins and/or Age Group awards out of 2,081 career races. Medicine Lake in Plymouth MN. How important is social running to you? If you were/are a competitive runner, can you adapt to the slower times and enjoy a social run? I don’t run socially unless you count my pacing – almost every weekend - as social. I talk to the runners in my group, always reassuring them and calming them down when they get anxious. I was never competitive unless you count my personal goals, which I always attain. Obstacles along the way: In 2005 I underwent ACL surgery for a torn meniscus that was unrelated to running. Thirty-one days later I walked-ran a marathon. I know my body and how to take care of it. If I feel a tweak or a ping somewhere I addresses it immediately with a massage or stretching. A favorite quote: "Limits exist only in the souls of those who do not dream." Not sure who said it. Running-training philosophy: Running is my life and my career. I never married or had kids, so this is what I do. And like any career, I work hard, don’t miss work, and I’m goal oriented. No one gives me a raise if I do well but I get my bonuses from the emails that pour in from runners in my pace group that I helped set a PR or a BQ. What are the some of the changes you have seen in running? Since I started running marathons in 1993, I have seen more females on the race circuit, which is a good thing for everyone. The second biggest change is technology, as in head phones, Garmin watches, GPS trackers, etc, which I am not a fan of as it takes the fun out of running. With headphones you don’t hear the crowds cheering which is the best part of the race. And then there’s the bling factor and the race fees. Why do I have to pay $180 to run a marathon when I don't care about the bling. Running in all 50 states, which I have done four times, has also changed since I started that goal in 2002. Back then there weren’t as many marathons as there are now, so the planning was a lot more difficult. For example, in 2005 there were basically 314 marathons in the United States, with a high percentage taking place in October and November. Today there are more than 1,300 marathons in the United States, according to the latest statistics from the Running USA Annual Marathon report. There are now only 27 days in the calendar where there isn’t a marathon. How has running helped you with the aging process? What aging process? I’m too busy running a marathon every weekend to think about getting old. Running keeps me fit, healthy, active, and engaged which is the best way to stay youthful as we age. And I have a great social network of friends that I see at races, even if it is just once a year. I have friends everywhere. What are the biggest lessons (life lessons and running lessons) you learned from running? To follow your dream down the road and don’t let the little bumps get in the way. And more importantly, share the gift of running with others. What advice would you give a younger runner who wants to run for life? The most important goal is to make sure that you are having fun. Don’t make running all about getting BQs and PRs. Some days will go as planned and other days will be a total washout or mess. When the body tells you it is tired, then slow down and/or take a few days off. I am not a streaker so if I am feeling not 100%, I take a day or two off until I am ready to get back to running.